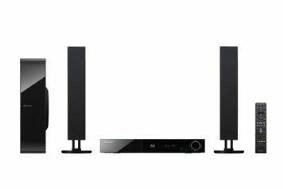 Pioneer unveils three Blu-ray home cinema systems | What Hi-Fi? Three-strong all-in-one BD range includes 5.1 and 2.1 versions, priced from "under £500"
All three models deliver Full HD 1080p video playback, as well as allowing users to view videos, photos and music from a variety of sources including USB, Apple iPod/iPhone, Bluetooth and DLNA-connected devices. Kicking off the range at "under £500" is the entry-level BCS-303 with four small satellite speakers, a slim centre speaker and subwoofer, delivering 180W across five channels. If five speakers is too many and you prefer a 2.1 system, the BCS-FS505 (pictured) has two front speakers that can be positioned vertically or horizontally and a slim subwoofer. Power is 2 x 180W. Again, the price is likely to be "under £500". For those who can accommodate a full-size rig, the BCS-707 system uses four full-size floorstanding speakers plus a centre and subwoofer. Power output is 5 x 180W, and the system is likely to sell for "under £600". For those who don't need Blu-ray and are happy to stick with DVD, there are three new Pioneer DVD home cinema in a box systems: DCS-202 (£250/5.1 with compact speakers); DCS-404 (£tbc/5.1 floorstanding speakers); and DCS-FS33 (£299/2.1 virtual surround).